A lot of my dinners start off with chickens. But never have I had a dinner that started off … meeting chickens. My friend Kate found about the dinner at Goat Lady Dairy, and told us about it and as soon as I read about it on the website, I was in. Actually, all I had to read was “goat cheese truffles” and I was in. So last night, Kate and Charlie, Anne and I (husbands were working, sadly) and Anne & Kate’s parents, Linda and Eddie, packed ourselves into the car and made the 50 minute drive out into the country (and it was indeed) to have dinner at the Goat Lady Dairy. Our evening started off, as I mentioned, in the chicken coop. Steve Tate, one of the owners of the 15-year old goat farm, assured us that we would be better off not looking down at our feet while he chatted. We happily complied. Steve gave us a little history of how Goat Lady Dairy came to be, but more near and dear to my heart, he waxed poetic about sustainable farming. If you’ve seen Food Inc, you know we’re in a tad bit of trouble – food wise – in this country. And I’m not just talking about the stuff that I usually talk about – weight loss, obesity, health. We’ve got totally disconnected from where our food comes from… and what our food is – and what that is doing to all of us. There’s a whole heckuva lotta stuff in the grocery store that your great-grandma wouldn’t even know how to identify, and I don’t think that’s a good thing. Cheap food comes at a great cost. Oops, guess who else can wax poetic about sustainable farming? Sorry, I’ll just to keep myself in check here… Anyways, the point I was going to make is – I liked Food, Inc. I thought it was informative. But it was also a little bit IN YOUR FACE, YO and I know a lot of people had a hard time stomaching the film. Steve was pretty much the opposite, but with the same message. He spoke from a place of passion and purpose. Here we all were to have a delicious farm fresh meal, and he had recognized an opportunity to minister to a captive audience about a simple idea: “Food is the problem, but food can be the solution.” (His direct quote, but I loved it.) And we were a captive audience – indeed, we were in the chicken coop. See if a bunch of us city folks can figure out how to work that pen latch. Genius. But genius delivered with a side of earnest, heartfelt truth about our food. The top cheese was a chevre mixed with carrots and a little bit of, I think dill? It was called the “spring garden goat cheese.” Amazing. And then the next one was called “Farmer’s Cheese” – a bit similar to a feta. The bottom one was called the “Smoked Round” which I will be buying in mass quantities to dollop generously on top of a tomato-basil-salad. I bit into that piece of cheese and my mind went “mmmm, summer.” The fourth one was a sweet chevre with honey and fig, and could pretty much have been dessert. Course two was a roasted sweet potato soup with a hint of thyme. I hadn’t had enough wine to throw my manners out the window yet, or I’m certain I would have tipped the entire ramekin up and slurped it clean. The third course was a cold kale (although previously sautéed?) salad with a sundried tomato lemon vinaigrette. This wasn’t my all time favorite, but that’s because I’m still learning to like greens. Not being a natural born Southerner, my palate still doesn’t quite know what to make of collards, kale and turnips. But I want to like them – hello, nutritional powerhouse – and this was certainly a step in the right direction. Fortunately Anne, Southern born and bred, finished off my plate for me. I informed her that she had gotten her fair share of vitamin K and her blood would be clotting well. “Uh huh, okay, but did you try the flower? It tastes like PURPLE!” was her response. The main event was venison and pork ragu served over a bed of polenta. Funny enough, we often had venison at my family Thanksgivings thanks to uncles who were handy with a shotgun and had a few too many Bambi’s in their backyard. It amuses me that I now see venison on some nicer restaurant menus as a “delicacy.” But, you can’t argue with good tasting meat right? Right. The next course (I know, right?!) was the infamous goat cheese truffles. Oh my souls. Goat cheese and chocolate? Amazing. Pound cake with dark chocolate sauce and an orange whipped cream. I was too full at this point to actually eat much of the dessert, but I do love me some real whipped cream. I now pledge this: I shall forever add orange zest to my whipped cream. The food was amazing. I wish I could go back weekly, because the menu changes each week with whatever is in season. The setting was perfection – simple, rustic and wholesome. It’s obvious that everyone who works there believes in what they’re doing and why they are they, and it shows. How could I forget to tell you about the goats? Well, for starters, they were all pregnant. Like, due any day now pregnant! After our session in the chicken coop, we were introduced to the goats. I am quite certain Locke is going to have to buy his wife a goat this summer or else she is just not going to ever be happy again. Although, I believe she said she’d be okay with a few chickens, too. SO! If you live in Winston-Salem or Greensboro, make yourself a date with some goats and chickens and truly amazing meals. Gather up some friends, bring a couple bottles of wine (it’s BYOW) and don’t wear your favorite shoes. If you don’t live here, read Animal, Vegetable, Miracle. Watch Food, Inc. Find a Farmer’s Market. Cook seasonal. Get a goat. Do what you can do – I think a lot of people get stuck because they feel like if they’re not going to go 100% organic, local, whatever, then they shouldn’t do it at all. I’m a far cry from eating “ideally” all the time (I’m certain the “Pirate’s Booty” I’m eating as I write this is neither local nor organic nor…gasp… nutritious…) but whatever small steps you can make towards eating in a way that supports your health and yup, the planet’s health, count. And I mean, if eating sustainably means eating goat cheese truffles for dessert from time to time, well I’m sorry, that’s just the price you’ll have to pay. Happy diners – Kate, me, Anne. Last Sunday, Jamie and I had plans to go peruse the new shops along Burke St – Gusto and Re-Tale. However, our plans were a diverted when we got there and realized both were closed on Sundays. Girl Scouts that we are, neither of us thought to look online or call ahead for hours. We scrapped our shopping plans, and decided instead to go chill at BrewNerds and catch up over some coffee. As we zig-zagged our way from Burke St over to Fourth St, a little thought popped into my head: I love this city. I’m surprised to say this, but I think I’ve fallen in love with Winston. 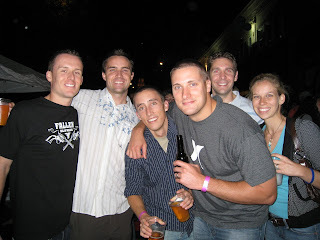 I was not very excited to leave DC in 2006 to move down here and had there not been a handsome, funny and lovely medical student residing here, it’s safe to say I would not have relocated to the Dash. I didn’t have the fondest memories of the city from time at WFU, but then again I rarely left the “Bubble” except the rare venture to Daytona’s (now gone) and Burke St. Not exactly Winston’s finest. And, in my defense, many of the things that I love today about Winston didn’t exist, or are even still “in the works.” I adore 6th and Vine and Noma – both of which are new additions since I’ve moved back here. I’m excited about a/perture, and Barnhills (wine + bookstore, opening soon on Burke St) and the gorgeous baseball stadium that will have opening day in just a few weeks. I love that tonight’s agenda includes a for-charity fashion show (at Level 23), a Prosecco tasting (at Cafe Pradda) and boutique shopping (at Gusto and Re-tale). Excuse me, fashion shows and Prosecco? This isn’t the Burke St Pizza and Rose’s Deli Winston I remember from college. I love that after 8 years of driving and running here, I finally get how downtown, West End and Ardmore all connect. I love the white office that’s been restored on the corner of Reynolda and Northwest Blvd. 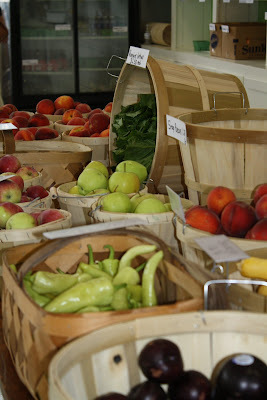 I love the Krankies airstream coffee place, Reynolda Farm Market and Mostly Local Market. I love that the slow food movement is gaining speed in Winston. I love the plans for The Olio. I love that half the people I follow on Twitter are local Winston-Salem businesses – and when I mention that I’m visiting them, they respond like a good friend would. I love that Southern hospitality can be found anywhere you look. I love that every time I drive by Corpening Plaza I remember pulling up there in a big limo and seeing a huge white tent, my smiling groom and all my favorite people in front of the waterfall backdrop. I love that we decided to get married in “our” town. I love that the gorgeous modern looking ISP building is diagonally across the street from my creaky floor, exposed pipes ceiling yoga studio. I love that where tobacco once thrived, now vineyards flourish. I love that I live “out in the country” but it still only takes me 25 minutes to get downtown – with bad traffic. I love running through Buena Vista, and seeing the variety of architectural styles, time periods and new construction built to look like old. I love that it has sidewalks, and big trees, and dogs being walked every hour of the day. It’s a good place to call home. Did you know that you actually have to aim the darts? 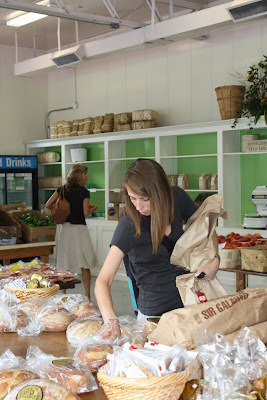 I have always been a Farmer’s Market girl. There’s something that just feels right about handing over your money to the person whose hands may have actually been responsible for planting the seed or turning the soil where your broccoli came forth. Call me a agro-romantic if you will, and I’m sure every Farmer’s Market vendor isn’t the bushel and peck stand I’m picturing but HEY. I like to eat off the land my zip code is remotely close to, what can I say? Today I took my mom and my sister to Winston’s newest spot for locals who like locals, and I was in produce paradise. I started getting twitchy the moment we walked up and there were just piles of big ol’ honeydews stacked outside. The Reynolda Farm Market is open in the space that used to be Pink Mink (Reynolda Rd, across from The Children’s Home) right in front of the Krankie’s Airstream. (The airstream should be a pretty good reference point – there aren’t many retro-rv’s-turned-coffee-shops are there?) They just opened this weekend, but the goods were plentiful already. 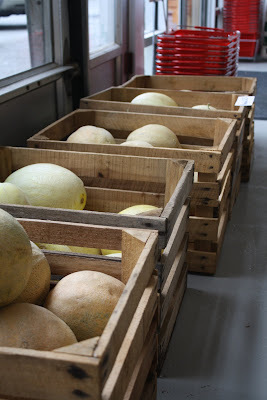 I walked out with a big bushel of peaches, a bag full of teeny mac apples (I love little apples), and a huge bunch of broccoli. I know my husband is super excited about that last one. They also had tons of bread and granola from Ollie’s Bakery, fresh coffee from Krankie’s, goat cheese and chicken from a nearby farm. 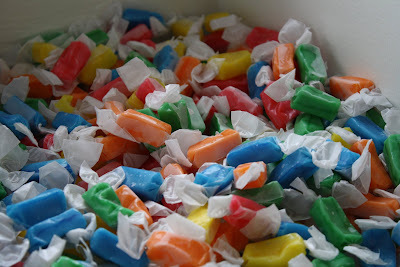 And even, get this, 5 cent candy pieces. I mean, come on. Play on my nostaglia a LITTLE more. I dare you to click on this picture and make it full screen. Tonight’s dinner menu: 2 mini apples, a hunk of broccoli with cilantro-lime ranch (that I made, not from RFM), a peach and a big chewy slice of olive oil & sea salt bread from Ollie’s Bakery. It’s 10:38 pm, the sun has set on the city. The crowd is well-dressed, martini glasses or Pilsner glasses in hand. Dates lean over Anthropologie-esque oil candles on two-top tables while a bachlorette party collects on a leather couch, stacking up one empty shot glass after another. The crowd is noisy but not overbearing, and the music a perfect complement. Photographs of the city reflected in windows and caught by the eye of the artist adorn the walls, but the rest of the decor is sparse, urban and clean. Noma, thank you for coming to Winston. You make Fridays a little bit more lovely. About two weeks ago, all the new interns arrived in town and we’ve been having lots of get to know you activities. Last Tuesday, one of the new interns emailed the group to invite us to get together at Filling Station. 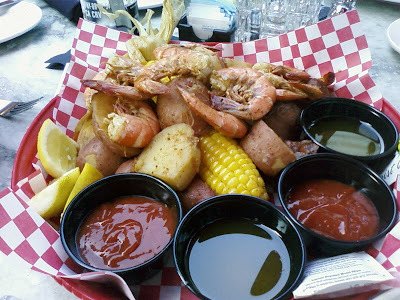 Apparently every Tuesday night, FS has a Shrimp Boil and features a cosmo and coronitas special and beach music. But I had never known about their Tuesday night Shrimp Boil, and we were excited to try it out. Three things we love: seafood, beach music and cosmos. Or coronas, if Matt was writing this entry. A trio of happy things. Nothing disappointed, except perhaps the choice of table location (right underneath the speakers) and we had a great time getting to know the new interns. It’s funny how people brand new to your town can introduce you to things you’ve never known was right under your nose, perhaps because you just start to become so comfy in your own town you stop seeking out new things. Low-Country Boil: Shrimp, Sausage, Corn, Potatoes, YUM. Have you ever felt like a tourist in your own town? It makes me inclined to seek out some new experiences in our town – I’m sure there’s many other nooks and crannies in Winston I have yet to discover! It makes me even more excited to know that we’re here for the next three years of residency, because I’m sure there’s much more in this town I have yet to find. 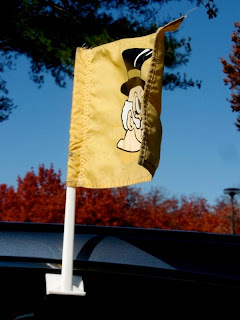 Bah duh da da da da da da GO DEACS… bah duh da da da da GO DEACS…. (Or at least that’s how it sounds in MY head.) This has been a roller coaster basketball season. First, we were amazing. Unstoppable. Steam rolling over both Duke and Carolina. Then, we start losing should-be-easy games – games against Miami and GA Tech. 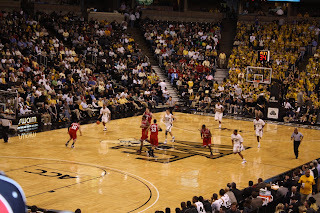 In my 9 years as a Deacon, we have ranged from being #1 and Cinderella-storied all over the place, to being most commonly confused with a small liberal arts school in Chicago until a Tim Duncan reference is made. Oh Wake Forest, they’ll say. One thing I can say about Demon Deacon basektball though, is every game is exciting because you never know what you’re going to get. Classic Wake Forest: unpredictable, at best . Unpredictable at their best. Thanks to our friends, Emily and Wiggy, we got to enjoy an in-person win at the Joel. 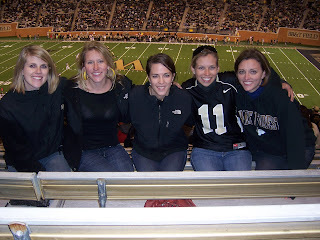 Beating State doesn’t cause quite the same ruckus as Duke or Carolina win does, but every Wake fan probably has a half dozen State fans in their inner circles of colleagues, friends and family and a little Friday morning bragging rights is always fun. Welcome to Wino Weekend. If I took the time and wrote out how I feel about these girls, we would be here all day. 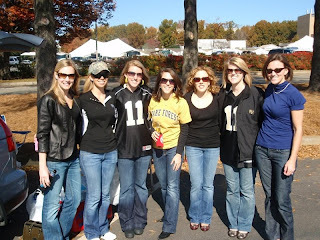 Suffice it to say, there has been nothing like the friendship of this group of girls for me. We love each other unconditionally, support each other unanimously and go above and beyond the challenges of long distance friendships to make time for another. Having all six of us in one place – especially the place we were “born” 5 years ago this fall – is perfection. Friday night, half the girls arrived and we met up for drinks with Sigma Pi alum at Fox & Hound. 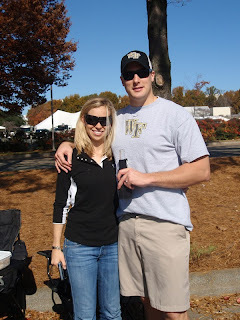 Saturday we packed the show on the road and tailgated for a few hours, before enjoying a sweep of a football game against UVA. The afternoon was sunny and unseasonably hot, with the backdrop of gold and reds as the only reminder that it was still fall. The afternoon was filled with eating, chatting, drinking, laughing, cheering and just a general feeling of fullness. By dinner time, our age had started to catch up to us. We convened at an old Favorite, the Mexican restaraunt on University that we’d chow down on chips and salsa and ‘ritas before many a lounge party. After our 4-table party had taken in an abundance of chips and Dos Equis, the carb coma set in hard, and we opted for winding down at our house instead of going out downtown. This morning, we topped off a perfect weekend at “our” place – 4th Street Filling Station. There were six of us crammed into a both, just like every Wednesday night, senior year. (But, I confess 2 winos were on the road and/or sleeping, and the six-some was completed by 2 Wino Husbands.) There were no KJ bottles ordered, but the feeing of absolute contentment from a good meal shared by good friends was ever the same. I felt nostalgic for so many reasons I pulled off in the direction of I-40 West to go home while my friends departed to the East, to catch planes to New York and Boston, to return to the other side of the state to Raleigh or to head up north to Charlottesville. We returned to our separate lives, together always. One thing Winston-Salem is well known for is it’s tremendous variety of places to get some good grub. However, we keep finding ourselves repeating the same places over and over again – because they’re close (Kimonos/El Dorado), they’re a good price (Kimonos/any mexican place/east coast wings), or we know they’re tasty (Village Tavern, Village Tavern, Village… you get the point.) So the other day, we got a coupon for $10 off at Texas Land and Cattle. I have to say, generally I am not a huuuuge fan of steakhouses. My dad is a whiz on the grill and Matt has deftly picked up where he left off, and it’s hard to justify going out and paying for steak when the men in your life can serve it up at home just as good, if not better. But, I’m a coupon-lovin‘ gal, so we thought we’d give it a try last night. My expectations were low. I was anticipating the environment of Texas Roadhouse (which Jamie loving refers to as the Wal-mart of steakhouses) with the cheesy “meals with alcohol flavors” theme a la Chili’s based on their online menu. I was wrong and I’m happy for it. The atmosphere was way nicer than I thought – just a small step below Riverburch caliber – and the food was delicious. No nutrition information posted online, which is about the only thing that disappointed me. Definitely a new one to add to our rotation. *And then there were these fellows…. A scrappier bunch could nar be found. (Thanks goes to Jamie, the picture is hers.) Who says you can’t have fun in med school? We had a great time though, and it was nice to get to do something a little different from our usual weekend routines. Winston is growing up quickly and it’s exciting to see it’s nightlife and it’s population growing and shifting as it discovers what kind of city it wants to be.